AmoyShare AnyMusic 5.0 was available as a giveaway on February 10, 2018! AnyMusic is the best music downloader that empowers you to discover, download, and play any music as you wish. 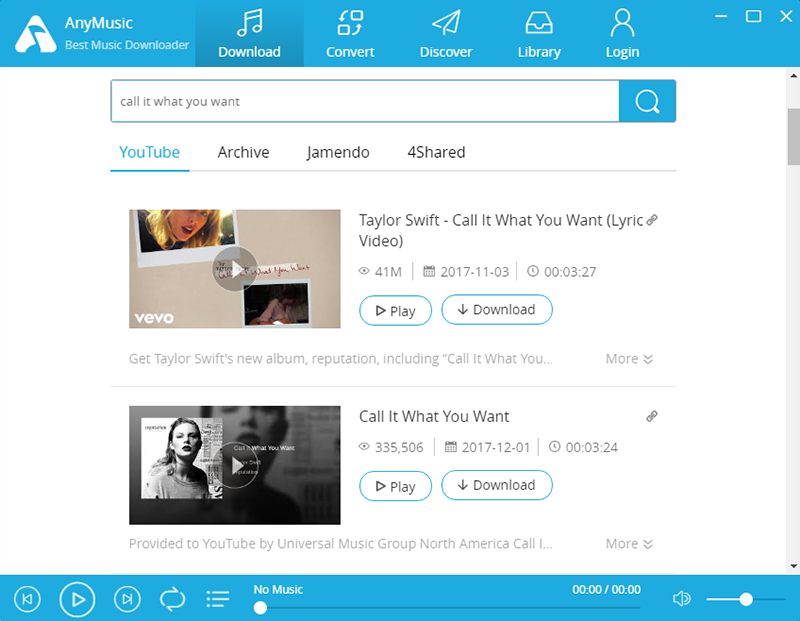 Whatever music search, online streaming, free MP3 download, music video download, media file conversion, AmoyShare has got you covered. Download Music and HD Videos. 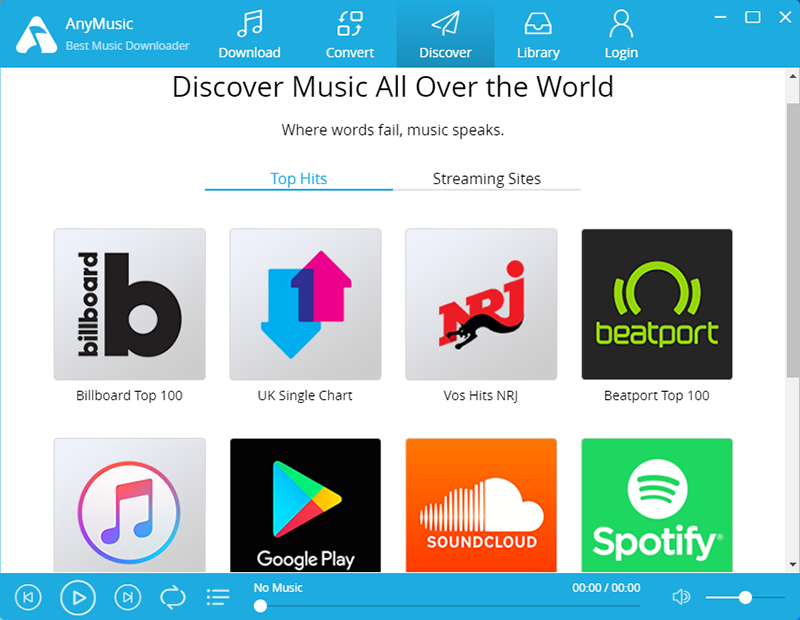 With AnyMusic, you can directly download unlimited music and HD videos, too. The download process is quick and simple, and you can choose different sound qualities if needed. Convert Local Files. AnyMusic allows you to convert local audio and video to multiple formats, such as MP3, M4A, FLAC, OGG, WAV, WEBM, etc. What’s more, you can trim your audio and video files. Please note, the offer includes 1 year free membership! If you have already used your email in the previous AmoyShare promo, you won't be able to use it again, please register with the new email! How would you improve AmoyShare AnyMusic 5.0? You really have to add sources to the application. 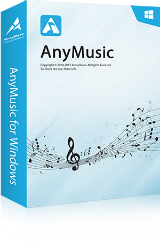 Hello Everyone, Thanks for your interest in AnyMusic for Windows. On behalf of tech support team, we would like to express our sincere gratitude to you. In order to help you better utilize this tool, we just place this post here with useful guides and more. Registration Guide: Register on the giveaway page with valid email and password, and click “Get it for free.” It’s done! You just create a new AnyMusic account and activate the lifetime membership at the same time. And please attention that our giveaway is only available for the new users. After login, if you get a massage to tell you that is 14 free trial, please re-installing the software. Software User Guide: 1. Install AnyMusic MP3 Music Downloader We have both 64-bit and 32-bit. So just choose one as you need. 2. Log into AnyMusic Launch the program, and enter your email and password to proceed log-in step. Then you can download music as you want! Music Download Tutorial: https://www.amoyshare.com/free-mp3-finder/get-free-music.html P.S. Some users may want to know about AnyMusic for Mac, just visit the page https://www.amoyshare.com/anymusic-mac/. Please note that this lifetime membership is applied to all version of AnyMusic. So just download the new version to get full features of AnyMusic. If you have any problems or suggestions about our product, please feel free to send feedback to us via Facebook or drop an email to support@amoyshare.com. so i stoped it, what now? ?Why it gave me this warning?? I have my PC set to highest security, to be absolutely safe, so maybe this is the problem, or your update is the problem, strangely it gave me this warning by trying to update, when i installed 5.0 it didnt gave me any warning, even by downloading it at first there was no problem, same with the update, but when i double clicked it this warning popped up,, and ???? What now ??? AnyMusic Team, Windows defender gave me a warning, that the app (your update) could damage my system, so i stoped it, what now? ?Why it gave me this warning?? I have my PC set to highest security, to be absolutely safe, so maybe this is the problem, or your update is the problem, strangely it gave me this warning by trying to update, when i installed 5.0 it didnt gave me any warning, even by downloading it at first there was no problem, same with the update, but when i double clicked it this warning popped up,, and ???? What now ??? AnyMusic Team, I have downloaded and installed the GOTD. I have also upgraded to 6.0. I have logged in to the program and it still shows unregistered. Try log out, close the program, and relaunch it. The problem may be solved out. Todd Ryser, Try log out, close the program, and relaunch it. The problem may be solved out. Todd Ryser, did you use an old or a new account? The problem of the lifetime price has been solved. Hello, everyone, The problem of the lifetime price has been solved. Sorry for the inconvenience. The giveaway of AnyMusic is for one-year membership. If you want to be our lifetime membership, you can buy the lifetime. It is cheap now. Thanks for your love to our product. Michelle, The giveaway of AnyMusic is for one-year membership. If you want to be our lifetime membership, you can buy the lifetime. It is cheap now. Thanks for your love to our product. AnyMusic Team, Got GOTD version, installed & activated, upgraded to lifetime membership, upgraded to v6.0, then noticed the software says "unregistered". Sent email to support and no response so far. No good. For anyone who has logged into AnyMusic but still got the notice "Unregistered," please send an email to support@amoyshare.com. We'll reply to you as soon as possible. I had no problems with download or installing; running Win 8.1, 64-bit. Have tried the program out as far as searching for several songs, downloading them from the links found, and converting them to Mp3's - easy and sound great! I'll keep the program, and if the $19.99 lifetime offer is true and still valid, I would be very interested. Thank you, AmoyShare and GOTD. We've corrected the lifetime rate to $19.99 and this offer is still valid. Hi acybersleuth, We've corrected the lifetime rate to $19.99 and this offer is still valid. What location on the hard drive are the downloaded files located? The download files is on the "administration" --> "my video" or "my music". Or you can click "Open Saved Directory" directly on the page of "Library" from AnyMusic. Brian, The download files is on the "administration" --> "my video" or "my music". Or you can click "Open Saved Directory" directly on the page of "Library" from AnyMusic. Well, during the install, did the reinstall trick and registered and jumped through all the hoops to get a registered version. Anyway, decided to go over to Vimeo, as it is said to be a supported site. Grabbed the URL like it asked for, pasted it, searched, program found the video but after 10 minutes of trying couldn't download and of the info for it. Told it to download anyway, without the fancy info, and it just sits there and does nothing. After 15 minutes I gave up. Not worth my time, especially since I have other software that does the job. I second that most of the vids come from youtube. Didn't try to download from them as I already have an outstanding program for that (and it checks channels regularly to see if there are any new vids and downloads them automatically too!!) Well, during the install, did the reinstall trick and registered and jumped through all the hoops to get a registered version. Anyway, decided to go over to Vimeo, as it is said to be a supported site. Grabbed the URL like it asked for, pasted it, searched, program found the video but after 10 minutes of trying couldn't download and of the info for it. Told it to download anyway, without the fancy info, and it just sits there and does nothing. After 15 minutes I gave up. Not worth my time, especially since I have other software that does the job. Will be uninstalling. Tried to buy the lifetime membership for $19.99 as is stated on the site as I apparently already have an account. when I go to checkout, the page want's to charge me $119.76 every two years. That is NOT lifetime. Uninstalling. The price of lifetime has been corrected. TranceWarp, We are sorry for the inconvenience. The price of lifetime has been corrected. Now you can purchase. The price has been corrected, and you need to refresh the page, then you can see the correct rate. TranceWarp, The price has been corrected, and you need to refresh the page, then you can see the correct rate. Looks like the music comes from YouTube. I could look them up on YouTube to listen to the music but at least this program offers to down load the video or the mp3 sound. The problem is that many of the popular songs on YouTube are copyright and can't be downloaded by this program. Looks like the music comes from YouTube. I could look them up on YouTube to listen to the music but at least this program offers to down load the video or the mp3 sound. The problem is that many of the popular songs on YouTube are copyright and can't be downloaded by this program. Tried to download a YouTube video and it told me it was copyright restricted! Just what I need: a program to police my downloading! But we are not policing your downloading. Because of the copyright , the YouTube video cannot be downloaded. Alcibiades, We are sorry for the inconvenience. But we are not policing your downloading. Because of the copyright , the YouTube video cannot be downloaded. Download and installed on W10 no problem including updating to version 6. It seems to do a great job of finding and coming up with a list of which version of a song you would like to have. The only problem I have is, if I decide to preview the song first the icon to download has been covered over. Now I have to shut down and restart the program so I can click on the download icon. Hopefully version 7 will correct this problem. All in all the fact that it's free it's a keeper. Dont install V5 just download V6 and register. Dont install V5 just download V6 and register. Need to download file from here for registation details Works fine. Had I seen that this was only for a year, I would not have downloaded it. I vehemently detest those subscription-type products. However, in this instance, I am glad that I didn't know that, because I really like it. It has a search function, and all you have to do is type in the search words (song title, artist, etc.) and it pops up a list of online content. Clicking the download button causes a window to popup, and all you have to do is to select whether it is video or audio only that you want downloaded, and the format of your choice. It quickly downloads your choice. Opening the "Library" tab allows you to play the downloaded items. It works quickly and flawlessly on Win7 computer. If you like AnyMusic you can purchase the lifetime membership, it's only $19.99 right now, and this offer is still valid. Hi Sparky, If you like AnyMusic you can purchase the lifetime membership, it's only $19.99 right now, and this offer is still valid. If you have registered AnyVid, then you can only use AnyVid with that account you have registered. Osborne, If you have registered AnyVid, then you can only use AnyVid with that account you have registered. And if you want to be our one-year membership of AnyMusic for free, you need to re-register a new account Thanks for your supporting. Why would I need to jump through the hoops to get this program when I can use my Firefox extension to do the same thing? I am not trying to put this product down but I am interested in what advantages this offers. You will find it easier to copy and paste the links in a new window rather than clicking it. dan, Check out this link for download extensions.... https://addons.mozilla.org/en-US/firefox/search/?platform=windows&q=youtube+download You will find it easier to copy and paste the links in a new window rather than clicking it. Looks good - I'll give it a shot. Good program but no point converting MP3 to FLAC as it won't have any quality improvements. I installed, I like it very much, exactly what I need (I already have an account with you), I decided to pay $20 for the lifetime version (I hope I would be able to install it on two computers of my own?)... But instead of the $20 expected the sum displayed is 550 PLN, which is well over $100. Can you please help? Piotr Obminski, We are sorry for the inconvenience. The price of lifetime has been corrected. Now you can purchase. Why is this please, before i commit to buying. Went to sign up and opted for the lifetime at $19.99 and for some reason, it states in the transaction: Product Name	Duration	Billing Period	Unit Price per Subsequent Subscription Period AnyMusic Biennium	unlimited	Every 24 months	112.63 GBP Why is this please, before i commit to buying. Vincent Andrews, Looks like we will not get an answer. Thought that i would just get the free version, but because i signed up to buy the lifetime one. It now will not accept my email adress and i do not ever use any other email adresses. Vincent Andrews, We are sorry for the inconvenience. The price of lifetime has been corrected. Now you can purchase. AnyMusic Team, Tried again to buy the $19.99 lifetime version and after adding it to the basket, it still want a payment of 114 GBP Biennial. Totaly fed up and disapointed. It probably the problem of cache, and you need to refresh the landing page. Hi Vincent Andrews, It probably the problem of cache, and you need to refresh the landing page. AnyMusic Team, Thank you for your dedicated help. Have now purchased the lifetime license. Will now look forward to using it. Thank you again for your help. Carl Richardson, We are sorry for the inconvenience. The price of lifetime has been corrected. Now you can purchase. Yep works fine if you follow instructions. Great coverage of songs, old and new. I'll stick to youtube combined with general file downloaders and file converters from GOTD. - No need for anything else. Is it suppose to say Unregistered after log on ??? Worked no problem installed/update and registered. Downloaded, installed, and registered just fine! (do follow the instructions in the "readme" file). I tested AnyMusic 5.0 with audio download from YouTube....Worked really well. This is a keeper!!! We sincerely apologize for any inconvenience. 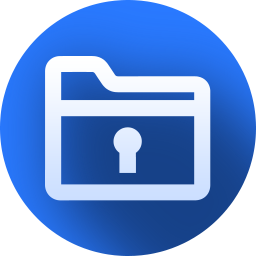 Please uninstall AnyMusic, delete all the relevant files of AnyMusic, and reinstall the new version 6.0 from https://www.amoyshare.com/anymusic/. If it still can't work out, please contact support@amoyshare.com and we'll offer more help to you. Hi Sabbath Breaker, We sincerely apologize for any inconvenience. Please uninstall AnyMusic, delete all the relevant files of AnyMusic, and reinstall the new version 6.0 from https://www.amoyshare.com/anymusic/. If it still can't work out, please contact support@amoyshare.com and we'll offer more help to you. a nice drop down windows once it checks 4 sites and allows several options for the output files. You also can either download a video or music file and it places these files in a library. If you don't like the library you can change it to another library. Next I went to the library where it stored the files and tried playing them. No problems with the music file. I had a problem with the video file it said missing a dll file from my video player. This might be a problem with my own system. There are some other parts to this software like converting Video to music. I haven't test the converter. So far its a real keeper. I downloaded the 5.0 version and didn't upgrade to version 6. Started the program. Next I went to the registering link found in the text file. I didn't have to stop any antivirus software. Next logon inside the program, This program has a nice drop down windows once it checks 4 sites and allows several options for the output files. You also can either download a video or music file and it places these files in a library. If you don't like the library you can change it to another library. Next I went to the library where it stored the files and tried playing them. No problems with the music file. I had a problem with the video file it said missing a dll file from my video player. This might be a problem with my own system. There are some other parts to this software like converting Video to music. I haven't test the converter. So far its a real keeper. I used the 64bit software. Installed as admin, fails to launch but task manager shows about a dozen processes. End task, restart pc, try again, freezes pc hard so I have to force powercycle. Now I get to resynch my mirrored drives. Yeah! It's confusing but appears to work. It states "A required privilege is not held by this client" and will go no furthur than that. What do I do? Godislove555, It is working now. Antivirus was blocking it. downloaded the program & the update--registered my name & password--then was told I'd have to pay--bought up the GOTD website from the "read me"--only to be told I was already registered--which I wasn't. You have a special offer on https://www.amoyshare.com/promotion/anymusic-gotd/ to get a lifetime membership for $19.99 but when I add it to my cart the price is $119. Do you have a special for $19.99 or not? We apologize for any inconvenience. We've corrected the lifetime rate to $19.99 and this offer is still valid. Hi Jonathan, We apologize for any inconvenience. We've corrected the lifetime rate to $19.99 and this offer is still valid. I keep getting a popup that says "This app can't run on your pc" What now? Make sure that you've installed the right version for your PC, both 64-bit and 32-bit are included in the installation package. mike guest, Make sure that you've installed the right version for your PC, both 64-bit and 32-bit are included in the installation package. I've provided my email and a password to log into the free 1-year trial, but cannot find anywhere to log in. when I try to download an MP4 I get a message saying I can download free for 20 minutes only. What am I doing wrong? I've just figured out the problem........., I'd not installed the application. Duh! Works fine now, downloading some of my favorite 70's music (Amon Duul, Hawkwind, Groundhogs, Edgar Broughton, Atomic Rooster etc). Will updating to the latest version invalidate the 1-year subscription? Stephen Brown, I've just figured out the problem........., I'd not installed the application. Duh! Works fine now, downloading some of my favorite 70's music (Amon Duul, Hawkwind, Groundhogs, Edgar Broughton, Atomic Rooster etc). Will updating to the latest version invalidate the 1-year subscription? The new version is still valid for the 1-year license. You can update it now and discover our new features. Hi sTEPHEN bROWN, The new version is still valid for the 1-year license. You can update it now and discover our new features. I have downloaded version 5 and now want to download version 6 as recommended, but can only find the option to either purchase or download the 14-day trial, is it possible for some kind person to post the link for version 6 other than the links I mentioned earlier. I have downloaded version 5 and now want to download version 6 as recommended, but can only find the option to either purchase or download the 14-day trial, is it possible for some kind person to post the link for version 6 other than the links I mentioned earlier. Many thanks in anticipation. Only offers 14 day trial - reinstalled x2 as suggested by developer but remains as only two week duration. Hi, you need to log into AnyMusic with the registered email address and password. If you're still confused about this, please contact us via support@amoyshare.com for more information. Compard, Hi, you need to log into AnyMusic with the registered email address and password. If you're still confused about this, please contact us via support@amoyshare.com for more information. Something seems seriously wrong with the 6.0 version. I downloaded and installed ver 5.0, per the instructions. Then upgraded to ver 6.0, as recommended. Ver 6.0 will not search for anything, and the drop down option stays at "All." This software will not work, other than to play existing music from my library. Just for kicks, I will uninstall the whole thing, then reinstall. i came across the same problem. then i closed the program, opened it again, and it worked. you can have a try. AnAceBuyer, i came across the same problem. then i closed the program, opened it again, and it worked. you can have a try. Brianna, I uninstalled an early copy of Version 5, and of version 1. Then reinstalled Ver 6. It worked properly then. Strange software, with no help or manual or detailed info. Can download an MP3 audio file, BUT the file does not have an MP3 extension? Can it be played with my other players, or only AnyMusic? Our new version - AnyMusic 6.0 just released yesterday. The new version also applies to this giveaway, and you can update it for free. As for the new feature, you’ll be amazed by the new “Discover” section. You can pick one streaming site, browse the page, and download the audio/video directly on the page. There’re more than 1000+ sites supported, which covers YouTube, Facebook, Vevo, Vimeo, Jamendo and more. Hi, Everyone Our new version - AnyMusic 6.0 just released yesterday. The new version also applies to this giveaway, and you can update it for free. As for the new feature, you’ll be amazed by the new “Discover” section. You can pick one streaming site, browse the page, and download the audio/video directly on the page. There’re more than 1000+ sites supported, which covers YouTube, Facebook, Vevo, Vimeo, Jamendo and more. Preceyese Seyeght, we are glad that you like it. If you love it, you can buy the lifetime. The price is very cheap. Purchase for once, and get the benefit of a lifetime. Thank you, again. AnyMusic Team, Please note that this lifetime membership is applied to all version of AnyMusic. 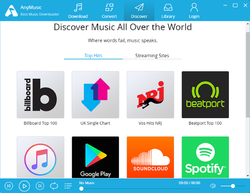 So just download the new version to get full features of AnyMusic. But not THIS version? As long as you registered for the giveaway as direction, you can access to all privileges. Godislove555, As long as you registered for the giveaway as direction, you can access to all privileges.